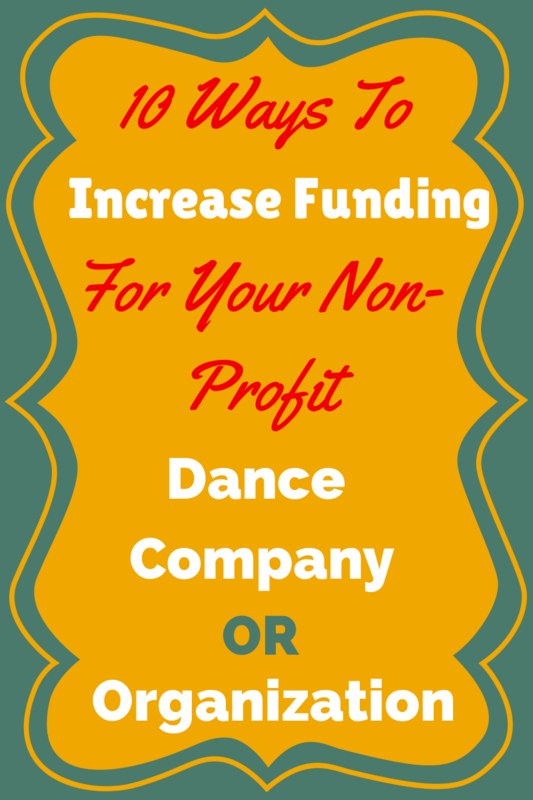 The Top 10 Ways To Increase Funding For Your Non-Profit Dance Company/Organization - The Let's Talk Dance Blog - Empowering Dancers To Create A Better Quality of Life! Have you ever wondered why some non-profit dance organizations and dance companies flourish, and always manage to get funding, and financial support, while others struggle year after year? Do you think this significant difference between the two groups is solely dependent upon the economy, and other external factors? Do you think that non-profit dance companies and organizations are at the mercy of the consistency of grants, a few private donors, and public donations as their only form of survival? Well, I have some news for you that may surprise you. The success/growth/sustainability of your non-profit organization is NOT solely dependent upon outside influences or external factors i.e. the economy, local/state/federal government, etc. The majority of the power lies in your hands. Although changes in our economy, and a lack of government funding for the arts have created more obstacles for non-profit arts organizations to flourish, that is no excuse, and no reason for your non-profit to not be receiving the financial support that it needs. There is LOTS of money out there, and LOTS of people who are willing to donate and support great causes/organizations. It’s just up to you to position yourself in a way that you can reach them, and they can find you. I am all for tradition in many ways. But, in other ways, I am hell-bent against it. Tradition says that we should all go to grade school, go to college, then graduate from college, get a “good job” with a 401K and health benefits, work 9-5, get a couple of raises throughout our working career of about 40 years, then retire. As you can see, there are some traditions that are outdated, and not realistic, especially considering the technology and social media-driven age that we’re living in today. What does that mean for your non-profit dance organization? It means that it’s time for you to get serious, and start treating your non-profit like a business. It’s time for you to treat your non-profit like the unique brand that it is, and start using non-traditional, radical, eccentric, and creative methods to get the word out about your organization, tell your brand’s story, and build an international tribe/fan base, that will support you, no matter what’s happening in the economy. 1. Take Ownership Of The Present State Of Your Organization’s Finances, And Accept And Recognize That YOU Have The Power To Change It. Don’t give your power away by placing blame or making excuses, “but the economy”, “but arts funding from the government is…”, “but people don’t have money”, “BUT…”. Stop it! Don’t make excuses. YOU have the power to turn your organization around, and as long as you have control, there is hope and unlimited possibilities for your non-profit dance company or organization to succeed. 2. Accept and Decide That It’s Time To Try Something New, Different, and Scary. If you have really big goals and dreams for your company/organization, and you want to reach higher heights than you’ve ever reached before, you’re going to have to start making some MAJOR changes, and doing something NEW! What you’ve done over the past few years (or longer) has gotten you to exactly the place where you are right now. A place that may have been comfortable, and good enough at one point. But it’s not anymore. It’s time for you to make some major changes, in order to move to a higher level of success, growth, accessibility, and sustainability for your organization. It’s going to take you doing something new, to get new results. 3. Determine What Your Community/Global/Industry Impact Is. Your organization should be having a positive impact on the community that it serves on a local, and possibly even on a global level. What is that impact? What does it look like? How is your organization affecting and improving the lives of those that you serve, and the community/world as a whole? How are you sharing that unique and compelling story with the world, and your target market? This is a major part of what will drive people to support you, and contribute to your organization’s financial needs. If I see a dance company who has really cool choreography, creative concepts, costuming, stage design, and well-trained, passionate dancers, I think, “Wow, very cool!”. I’ll probably share their info on Twitter and Facebook, and check out their Youtube videos, and that’s that. If I see a dance company who has all of those things, but is also involved in their community, volunteers on a regular basis, has video testimonials from kids, teens, etc. on how their organization has impacted their lives, and their community as a whole, I have a different reaction. My reaction to the latter is, “Let me sign up for their mailing list, so I can stay up-to-date on what they’re doing, and support them in any way I can. Maybe I should contact them about coming on as a guest on my radio show. I definitely need to help spread the word about what this organization is doing. How else can I support them?” See the difference? 4. Look At What Other Successful Organizations Are Doing, And Put Your Own Unique Spin On It. There’s a huge difference between being a copycat, and using proven tactics that work in many industries, in your own, unique and innovative way. I would recommend looking at successful organizations OUTSIDE of the dance field, as well as in the dance field, for inspiration and ideas on how you can grow your non-profit, stand out in the marketplace, and build your brand in an impactful, and prosperous way. Read books, blogs, do research, participate in webinars, and see what’s working for others, and apply those techniques to your organization. 5. Connect With Our Hearts, Not Just Our Minds, To Get To Our Wallets. Sorry if that sounds bad. But the point is, people need more than an intellectual, factual justification for giving your organization their hard-earned money. There are soooo many dance companies out there, and soooo many dance organizations. But each of you embody a unique back story and purpose behind what you do. You each offer something so special, and so unique, that it caters to a specific audience. We (the people) need to know what that is, and we don’t just want to read about it on the home page of your website. We want you to pull us in visually, and tap into our emotions in creative and innovative ways. Our cash/check books/credit cards are directly connected to our hearts. We make emotional decisions on how we spend our money every day, so that’s where you need to reach. 6. Do Something Completely Different And Unexpected. You don’t have to continue to do what’s already been done over and over again. Challenge your creativity, and try something completely different. Make it fun, make it interactive, and get people excited about what you’re doing. Make your audience feel like their opinion matters, and like they are an important part of your organization, not just financially, but creatively. Have a contest where your fans/followers get to choose what the theme/title of your next performance/event will be. Let people vote on it, and whoever comes up with the winning title receives complimentary entry to your performance/event, and VIP seating. You can do the same thing with trivia contests about people in your organization. Have fun, and get your patrons/fans interacting and involved with your organization on a regular basis, in ways that have nothing to do with them spending money. That way, when the time comes to solicit donations, they’ll be more obliged to donate, because they’re so used to being actively involved in your organization. 7. Get Help. Let’s face it. No one’s good at everything, and although you may be the creative or organizational genius behind your non-profit, marketing and promotion may not be your forte. That’s not a problem. Just make sure you get help from someone who does know how to leverage effective marketing and promotion to build your brand, and reach your financial and organizational goals. 8. Build Your Own Audience. You’ve heard the saying, “there’s power in numbers”. Well, it’s true in every sense. The larger the fan base/audience you have, the more likely you are to receive financial support on a regular basis, from that group, and even from private donors. Once you have a large pool of supporters to draw from, you’ll only need a small percentage of your fan base to make financial contributions in order to create the financial stability you need. Be sure to have an e-mail list opt-in form on your website, blog, and Facebook fan page, to encourage people to join your mailing list. That’s where you really get to build your audience, and create a tight-knit community of supporters. I think that non-profits should offer options for their supporters to make donations on a monthly basis, that is automatically withdrawn from their credit/debit card, even if it’s a small amount. That way you can at least have some steady income that you know is coming in, to help manage the resources you need on a regular basis. People who choose this option should of course have VIP access to all that you do, and receive lots of special incentives throughout the year. 9. Connect/Collaborate With Like-Minded Dance Companies/Organizations. I’ll bet you money that there are other creative, talented, passionate, and driven individuals, just like you, who have a non-profit, and are facing the same challenges that you’re facing. Why not collaborate with another dance company or two, to co-host an event or fundraiser, where all of you can benefit, and bring your audiences/fan base together, to reach a bigger financial goal? The more people involved, the better the opportunity for you to raise more funds, and also get access to a new audience that may not even know about you. 10. Leverage Your Social Media Audience. Did you know that your number of fans, followers, subscribers, etc., (your calculated sphere of influence) have financial value? Not only are there millions of people, for example, making loads of money on Youtube (through ad placements during their videos, and on their channels), but companies are willing to invest in organizations and brands, who have a significant influence on a large audience in their niche. Do your Youtube videos get thousands of views regularly? Do you have thousands of fans on your Facebook fan page? 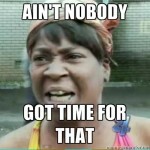 Do you have thousands of Twitter followers? Do you have an extensive e-mail subscriber list? If you do, use these numbers (your sphere of influence) to attract sponsors, investors, and donors, in exchange for some sort of advertising spot, on your website, blog, Youtube channel, etc. Remember, there’s power in numbers. If you’re not satisfied with the amount of funding and financial support that you’re receiving for your non-profit organization, then it is up to YOU to make the (radical) changes necessary to get the results, the funding, and the consistent financial support that you want, and need for your organization. Do you have more suggestions to add? Do you have questions, or need more help? Post your comment below, and I’ll be happy to help you in any way I can.